As we know, Fear Factor: Khatron Ke Khiladi has successfully completed its seven seasons. Now, it is to back with KKK Season 8. So, get ready to thrill again with action and stunts to watch KKK Season 8 on Colors TV. Khatron Ke Khiladi Season 5 was premiered as Fear Factor: Khatron Ke Khiladi - Darr Ka Blockbuster and Season 6 as Khatron Ke Khiladi - Darr Ka Blockbuster Returns. But KKK Season 7 was returned as Khatron Ke Khiladi: Kabhi Peeda, Kabhi Keeda. Khatron Ke Khiladi Season 4 is the fourth season of Fear Factor Khatron Ke Khiladi starting from 3rd June, 2011. Khatron Ke Khiladi 4 on Colors TV is scheduled to air every Friday and Saturday at 9 PM in India. Now, get ready to watch Fear Factor Khatron Ke Khiladi Torchaar, ultimate stunt realty TV Show. Fear Factor Khatron Ke Khiladi Season 4 on Colors TV is introduced as Torchaar. The season brings deadlier stunts for the participants. The season is set in the wild backdrop of Cape Town, South Africa. Contestants of Fear Factor Khatron Ke Khiladi Season 4 TV Show will be tested through nail biting stunts to make them physically and emotionally strong. Akshay Kumar will inspire and mentor them. The last man standing of Fear Factor Khatron Ke Khiladi Season 4 Show will be winner of the Show. He will be recognized as the ultimate Khiladi also. Winner of Khatron Ke Khiladi Season 4 will be knighted with the title of a ‘Thunder Star’. Winner will get a chance in an ad along with Akshay Kumar. Akshay Kumar promotes KKK Torchaar through autographed jacket on eBay. It is a charity auction. The auction is started to collect fund for Concern Indian Foundation. The auction will end on 9th June, 2011. It starts from Rs. 1001 for an autographed jacket. He has tried to promote the Show by many live stunts also. Torchaar is a scary and pain feeling word. Contestants will be tortured by the painful tasks in this season. Khiladi of the Show will win a car and “Thumps Up Thunder Star”. He will get a chance to perform in an ad with Akshay Kumar. Hasinayen will win the title of Khatron Ke Khiladi 4 and cash prize. You will experience never before phobias and fears through KKK Season 4. It is presented by Thums Up. It is a stunt reality television Show. We already have watched 3 seasons of the Show. Now, it is back with its fourth season. It is being assumed that it will bring harder stunts for the contestants than before. Khatron Ke Khiladi 3 is a new season of Fear Factor Khatron Ke Khiladi on Colors TV. Fear Factor Khatron Ke Khiladi Season 3 starts from 6th September, 2010. Danger and fear back on Colors TV with Khatron Ke Khiladi Level 3 in a new dimension. Khatron Ke Khiladi 3 host is the most gorgeous lady – Priyanka Chopra. She is a well known Bollywood actress and winner of Miss World title. She has acted in dozen of Hindi and Tamil films. Now, Priyanka Chopra comes back on Colors TV with Khatron Ke Khiladi Season 3 as a host. Khatron Ke Khiladi 3 on Colors TV is an adventurous reality TV Show. It is the third season of the Indian version of the American stunt/dare reality TV Show – Fear Factor. Khatron Ke Khiladi 3 TV Show is hosted by Priyanka Chopra. This season is filmed in Brazil. Fear Factor – Khatron Ke Khiladi Level 3 on Colors TV is presented by Garnier Men Deodorant. Khatron Ke Khiladi Tiguna begins with the beautiful scenes from Rio De Janeiro, Brazil. Khatron Ke Khiladi 3 contestants are teamed up with their partners also - Rahul Dev with Kavita. Rahul Bose with Annie, Milind Soman with Ritisha, Cyrus Broacha with Freisha, Manjot Singh with Andressa, Abhishek Kapoor Susheel, Dino Morea with Madhurima, Karan Singh Grover with Aarti, Angad Bedi with Mittal, Terence Lewis with Ananya, Armaan Ebrahim with Madhura, Ritwik Bhattacharya with Avni and Shabbir Ahluwalia with Sushma. Fear Factor Khatron Ke Khiladi Season 3 TV Show begins with “Jo Dar Gaya, Wo Ghar Gaya” tag line. Contestants will face 3 times more fear from the danger level this season. Khatron Ke Khiladi Season 3 Show begins with 13 men contestants with 13 Hasinayen. It is very different from its previous 2 seasons. It is a very daring Show like MTV Stuntmania Reloaded and D3 Commando Force. Fear Factor Khatron Ke Khiladi Level 2 is reality TV show which has started on COLORS TV channel from 7th September, 2009. The show was announced to start in 2008 and last date for registration was 15th February, 2008 but due to some delay the Show has been started from 7th September, 2009 in India. Host for Fear Factor Khatron Ke Khiladi Level 2 reality TV show is not new. It is Akshay Kumar who has already hosted Fear Factor Khatron Ke Khiladi. The reality show is known as danger show. It has tag, “Aise Khatre Baar Baar Nahin Aate!” It means there is double danger from its previous session. There are 13 participants in Fear Factor Khatron Ke Khiladi Level 2. They all are beauties. They are known as Haseenayein also. Fear Factor Khatron Ke Khiladi Level 2 reality TV show is really very dashing. All the Haseenayein have to face real danger and fear. They have to pass out from these dangers. Akshay Kumar can give safety belt, if anyone does very well. He can terminate or increase time duration if any doesn’t well. I just watched its second episode yesterday. It was really very fearing. All the Haseenayein have to go into the deep water to pick up balloons. In the second fear, they had to face out cockroach and spiders. Fear Factor Khatron Ke Khiladi Level 2 is my favorite reality TV show which learns a lesion of taking risk in life. Here, I learned to fight from fear which is inside us. So, I have a positive thumps to Fear Factor Khatron Ke Khiladi Level 2 TV show. Idea presents Fear Factor Khatron Ke Khiladi Level 2 is aired on COLORS TV channel from Monday to Thursday at 9PM. You can say about it that it is fear factor show. It is hosted by Akshay Kumar Bollybood champion or famous name “Khiladi”. It was broadcasted on colors channel at 10 PM every day. 13 celebrities were participated from various fields. Lastly, Nethra Raghuraman was declared winner of Khatron Ke Khiladi. It was really fear and most fear stunt show. In the show your courage examination had to be proven. Snakes on you and you have to find out your keys in some seconds. Bigg Boss, one of the most popular reality TV Show, has completed its 10th season. Now, it is assumed to broadcast Bigg Boss Season 11. To select common people, Bigg Boss Season 11 online auditions are organized across the India. How to Get Entry in Bigg Boss 2017? Official website of Colors TV arranges Bigg Boss 11 online audition. Contestants have to upload video describing his/her self to participate in Bigg Boss Season 11. Aspirants from the age of 18 years and above can fill Bigg Boss Season 11 registration form. How to Fill Bigg Boss 2017 Online Registration? The audition of Bigg Boss 11 Online Registration will begin from the end of April. Bigg Boss 11 online audition might be arranged by the end of the June. As per the news sources, Bigg Boss Season 11 will be broadcasted in the end of the year. So, if you want to participate in it, you may stay here. Big Boss is the Indian version of the Big Brother TV program. At first, Big Brother was developed and introduced by Endemol, a Television company in the Netherlands. Broadcasting of first Big Brother was finalized in the Netherlands in 1999 on the Veronica TV channel. The idea of Big Brother came in mind during the brainstorm session at the production house of John de Mol in 1997. Now, it is aired in about 70 countries on the same format from different names. Big Brother is known as the Big Boss in India. The first series of Big Boss reality TV show in India was aired from November 2006 to January 2007. This season was not the most famous. Sony Entertainment Television had aired the show in India. Bollywood actor Arshad Warsi was the host of the TV show. During the period of 2007, Shilpa Shetty won the Celebrity Big Brother UK. It was the breakthrough situation for Indian Big Boss. She got an honorable status in the UK to meet the prime minister, Tony Blair and Queen Elizabeth II. She became a big name in India also. She became the host of Big Boss 2 which was aired on COLORS TV channel from August 2008 to November 2008. She introduced Big Boss 2 in a new style. Indian version, Season 2 of Big Boss got good popularity among audiences. Big Boss is nothing but remake of Indian traditional joint family. There are less than 16 participants. They have to survive in a house which is locked from outside for 84 days. All the cameras will watch every activity of each participant. All participants are very different in their attitudes, thoughts, views, behaviour and lifestyle but all have to survive together for 84 days. Each participates have to survive minimum one week in the house of Big Boss. One member will go out each week on the voting of participants. All participants have to do their own job to survive their life in the house of Big Boss. They have to follow some rules of Big Boss. They have to live in a closed house. They will not contact from outsider till they live in the house of Big Boss. Big Boss is a platform where participants try to live together whom they don’t know very well. They try to help each other or cheat also. They entertain each other. Sometimes, they make angry each other also. Overall, Big Boss is the name of a house where participants have to live just like jail life. MTV Rush India is a new dramatic short film based on youth. 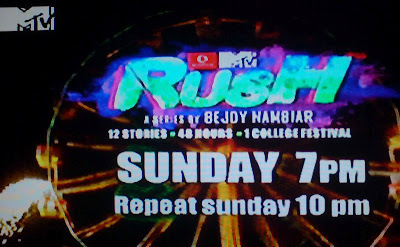 MTV Rush is premiered on July 15 at 7PM in India. MTV India brings – Rush, a very new Show about college guys based on 48 hours of their life. Now, the Show goes off air. First episode of MTV Rush is based on the story of Aahan. He loves his brother much. It was the day of October 27. Ayush introduces his girl friend – Sarah on his birth day. Sarah was a beautiful girl. Aahan falls in love with her. Aahan wants to keep himself away from her. But he was not able to control himself. On November 27, the matter came out. Ayush was much angered. He cut his nerve. There was nothing between Ayush and Aahan now. Aahan realizes his mistakes now. Ahan too leaves Sarah. She decides to go Australia. Someone calls Aahan to tell about it. Ayush suggests Aahan to meet her once. Now, Aahan goes to meet Sarah in college a festival in the first episode of MTV Rush India. He meets a drug dealer there. Aahan wanted to talk Sarah. But she refuses telling him that there is nothing in her heart for him. That was only mistake not love. Now, Aahan takes drug and drive his car. He meets a Baba on the way. The Baba suggests him to burn his car. He does so. First episode of MTV Rush was the story of Aahan’s mistake. It was the story of his 48 hours. Everything changes in his life in just 48 hours. MTV Rush is based on the 12 stories of 12 people. It is the story of 48 hours of their life. It is the story after college life. MTV Rush is created and directed by Bejoy Nambiar. You can watch MTV Rush Bejoy Nambiar in India every Sunday at 7 PM. It is the lesson oriented story of new generations. Tota Weds Maina is a new TV serial on SAB TV starting from January 14, 2013. Tota Weds Maina on SAB TV is scheduled to air every Monday to Friday at 10:30PM in India. It has gotten the vacant time slot of FIR. But it went on off on April 5th 2013 only after 59 episodes. Kavita Kaushik has played the character of Maina in Tota Weds Maina. She is a care-free girl. She loves to enjoy. She enjoys her life on her own condition in Tota Weds Maina on SAB TV. Gaurav Gera has played the character of Tota in Tota Weds Maina. Gaurav Gera was last seen in Love Ne Bana Di Jodi, Yeh Chanda Kanoon Hai and Baat Hamari Pakki Hai. Parashuram, Ramdulari, Kundan Mishra, Toti Tiwari, Leena Tiwari, Surprise Tiwari, Bhagwati, Radio and Video are also leading characters of Tota Weds Maina serial. Tota Weds Maina casts are every perfect in their role. Tota Weds Maina story revolves around Tiwari Sadan of Pratapgarh in the heart of Uttar Pradesh. It talks about Tota who is very shy, honest and simple guy. He prepares for CA. On the other hand, Maina is full of life, chirpy, bubbly and adventurous. First episode of Tota Weds Maina gives an introduction of Tiwari family. It sketches the lifestyle and character of Maina also. We watched Tota’s prayer to be a successful CA in the first episode of Tota Weds Maina on SAB TV. Today was the birth day of Tota. So, he tries to bring a cake in his house. He convinces his father to bring a cake on the occasion of his birthday. We watched Maina also in the first episode of Tota Weds Maina TV serial. She is very different and lives with her own style. Tota Weds Maina is a fresh and humorous series on SAB TV. It has captured the life style of Tota and Maina who are quite opposite to each other. Tota Weds Maina on SAB TV brings a fresh concept to entertain viewers. First episode of Tota Weds Maina was amazing. We enjoyed much watching it. It is a very creative and social drama series capturing two different people. Tota Weds Maina is directed by K. Mohit Kumar Jha. It is premiered on the same date of Hum Aapke Hain In Laws. Viewers can watch Tota Weds Maina on SAB TV every Monday to Friday at 10:30PM in India. Gumrah: End of the Innocence has successfully completed its four seasons. Now, it is to hit again with a new season that would be Gumrah Season 6. But it is yet to be confirmed. Gumrah: End of the Innocence is a new Show on Channel V starting from 11th March, 2012. It is scheduled to air every Sunday at 7PM in India. Gumrah: End of the Innocence is hosted by Karan Kundra. He was last seen in Bayttaab Dil Kee Tamanna Hain, Kitani Mohabbat Hai 2, Aahat and Zara Nachke Dikha. Now, he is back on Channel V to host Gumrah: End of the Innocence TV Show. First episode of Gumrah: End of the Innocence was based on the MMS scandal 2002 of Arpit and Anjali. Anjali Dobriyal was a 16-year old school going girl. She was the topper girl in her school. Her mother was an employee in a Bank. Arpit was also a school going boy and Tennis Champion. He makes an MMS of Anjali and sends to his friends. The scandal blew worldwide. People watched it on web also. To know the reality of Anjali-Arpit MMS scandal 2002, Gumrah: End of the Innocence Show gives a glimpse of friendship of Anajli and Arpit. Their friendship begins due to Anuj and Priya – their classmate. Anuj challenges Arpit that he can’t touch her. To prove himself, he makes an MMS video and shows to his friends. Knowing about it, Anjali gets angered and slaps him. The slap creates an ego inside Arpit. Finally, he distributes the video to all. To make some money, Ravindra Malik, a student of Engineering uploads the video to the WWW. The scandal became international now. Cops arrest Arpit and Ravindra. Arpit is sent to the jail. Ravindra is restricted from the college. Anjali wanted to be an IFS officer. Arpit wanted to be Tennis Champion for his country. Ravindra had a bright future in Engineering. But now, Anjali is a mother of two kids in just 25. Arpit changes his name and leaves the city. He works as a call centre executive. No one knows about Ravindra. A small mistake destroys the life of Anjali, Arpit and Ravindra. Anjali’s sister – Aditi also faced huge ignorance. Her mother left her job. Channel V tries to explore the mistakes and crimes committed by youngsters through Gumrah: End of the Innocence. Gumrah: End of the Innocence on Channel V is a social series to investigate the crimes committed by youngsters. The Show tries to know the views of people also during the investigation. Psychologists and other known people are asked to give their views on the crime committed by youngsters. Gumrah on Channel V is the show for today’s youth. It tries to capture the real side of teenagers today. Gumrah TV Show is based on the teenage crime and showcases the real juvenile crime incidents. You can watch Gumrah on Channel V every Sunday at 7PM in India.